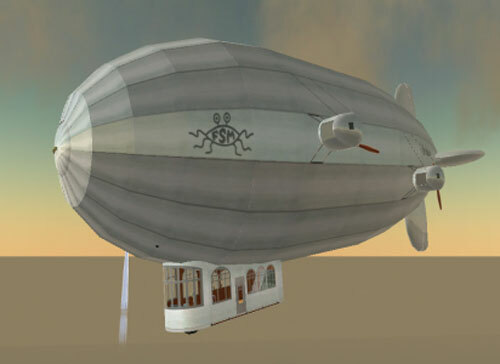 Blimps are the pirate ships of the sky. I recently worked for a local theatre company, where I stumbled upon this cool looking prop. Instantly I commandeered it to support my argument for the beneficial effect of adopting his Noodly lord, resulting in the convertion of 7 technicians and a couple of actors. We’ve all got an idea of what it was like to be a pirate in the 1700s – but a lot of it is pure Hollywood hooey. 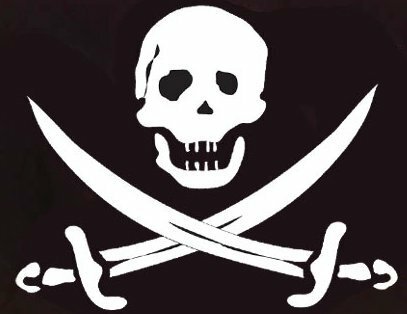 Here’s a few of our most common misconceptions about pirates … and the truth about them. Thales spotted this giant billboard in the Cordoba, Argentina airport. Notice the Pirate Fish. Lindsay spotted a similar ad in an Argentine magazine several months ago – posted here. To Know – The Argentina Cultural Patrimony – To Take, Yes – To Take, No. 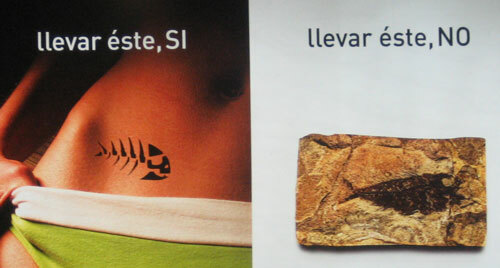 Lindsay interpreted the print ad as: The ad sponsored by the Argentine federal government is explaining what things can be taken out of the country, such as tattoos, and what things cannot, such as fossils. Its a cultural preservation type text. The web address printed, www.cultura.gov.ar (notice the government domain), seems to confirm this. The website appears to belong to a cultural preservation organization. What is intriguing is that there is no mention of the Pirate Fish on the website. Why did they use our symbol for their advertisements promoting cultural preservation? Perhaps it’s just a coincidence they used the image of the Pirate Fish – one of our most sacred symbols. But, I choose to interpret it as the first step towards official recognition of Pastafarianism by the Argentine government. It makes sense; I’m told Argentina is a devoutly Catholic country. The government is smart to gradually introduce a replacement religion; too suddenly, and people would surely protest. 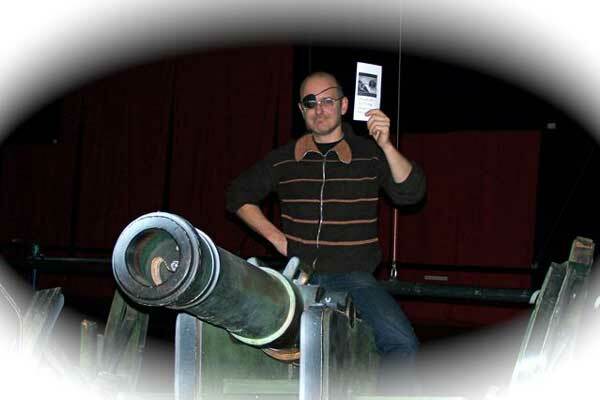 The Pirate Fish ad could be explained away as a “mistake” or “coincidence” if trouble arises. What’s next Argentina? I’m happy to help. I would be pleased to visit your country to help spread Pastafarianism awareness. Click for a less-small version of this picture. Here’s a chance to spread the good word! Here in Depoe Bay we’re doing our part in stopping global warming! Each year, pirates gather here in an effort to promote modern day pirattitude and help the earth … oh, yeah, AND to hunt for pirate treasure! This year’s event is on Saturday, October 6th. We’d love to see a Pastafarian contingent in the big hunt. If you’d like to send a pirate team (or 2 … or 3 …), simply go to www.treasuredepoebay.com, fill out an entry form, and send it in! Perhaps there’ll be a sighting of the Flying Spaghetti Monster here on the coast that day … ??? 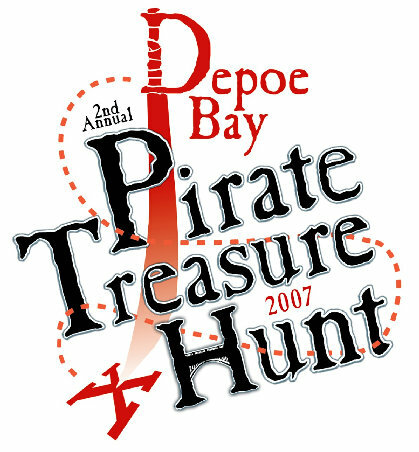 Click the picture to be taken to the Depoe Bay Treasure Hunt website. 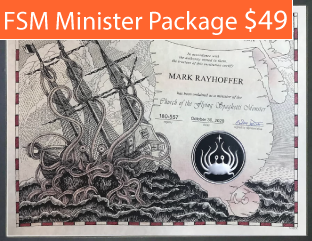 The Hallow Kingdom of The Flying Spaghetti Monster (HKFSM) was formed from a large amount of underground volcanic activity underneath the Pacific Ocean at 45 degrees North, 150 degrees West, starting west of what used to be California and ending southwest of Mexico. Unfortunately, the intense volcanic activity caused California and Baja California to plunge into the ocean, destroying large amounts of property. Fortunately, the Californians had enough warning to pack up their things, sell their doomed houses, buy yachts, and sail to the newly formed volcanic land. The first man to make landfall was a man named Bobby Henderson. Being the first man to make landfall, he instantly declared the land as The Hallow Republic of The Flying Spaghetti Monster. 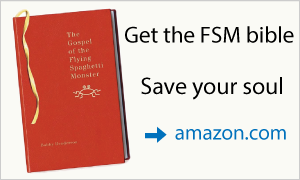 The HKFSM is a theocracy revolving around the Flying Spaghetti Monster. 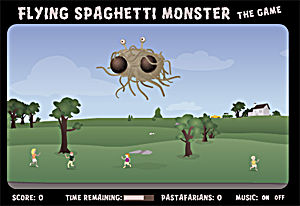 The religion of the Flying Spaghetti Monster (FSM), also known as pastafarianism, is a monotheistic religion. Its prophets teach that five thousand years ago, the FSM created the universe, but He spent one hundred years painstakingly preparing the universe to appear much older than it really is. For hundreds of years afterwards, humans lived in ignorance of the FSM, then He chose to expose Himself to us. 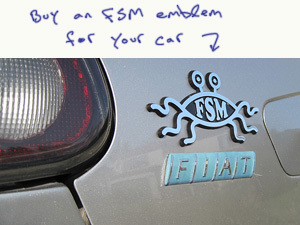 Twenty-five hundred years ago, He first revealed his Noodly Appendage to us, showing us the way. From this point on, those who accepted His message knew that we were to live a certain way-on the water in great wooden ships, loaded with grog, swag, and hopefully, wenches. This was His message. 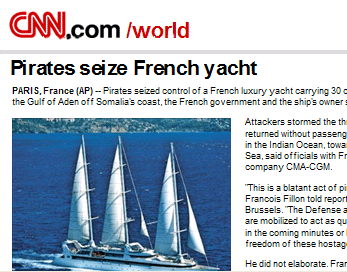 For years after this, the Pirates lived a life of peace and merriment, spreading His Word as far as places like Belgium. The pirates were eventually almost wiped out when they attempted to give candy to bloodthirsty Ninjas. When the entire population of former Californians had landed, they were surprised to see that plants, trees, vegetation, an amusement park, two major cities with suburbs, and a village inhabited by midgets had sprouted from the ground in a week’s time. 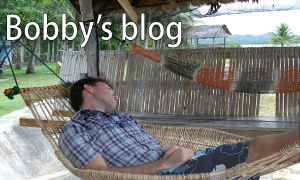 Bobby Henderson had been living in a hut on HKSFM that had appeared for him. He emerged and told the new inhabitants of HKSFM of the Flying Spaghetti Monster and of his new creation. The people heard and they Believed. The Marine Subtropical climate creates lush forests of palm trees and picturesque views. 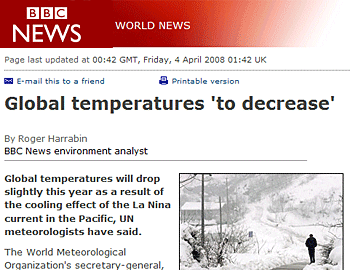 Since HKFSM is an island, its temperature tends to be warm all year long. The pastafarians tend to have a rather cavalier attitude with their environment, if they clear a forest to make homes, they are required, by law, to plant two trees for every tree they cut down. Every summer, the people of HKFSM gather up all their accumulated technological trash (spare parts, old cell phones, etc…) and throw them into large garbage trucks which dispose of them properly. The pastafarians on HKFSM are very strict about abiding to pirate attire, etc… At least 3 items of pirate attire are required to be worn at all times. On the religious holidays (Fridays), full pirate regalia is required. 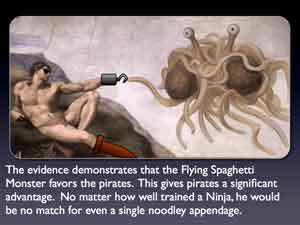 All the pastafarians on HKFSM consider themselves as seafaring pirates in some way. Most of the inhabitants use HKFSM as a home base after short fishing trips. The head of Government, Bobby Henderson, handles all matters of island security, tourism, etc… He is also the religious leader of the country. Food in HKFSM is world known. A group of pirates looted New Orleans and found some excellent Cajun chefs who wished to join the ranks of the proud citizens of HKFSM. Gorilla Soccer is a slightly modified game of soccer which is popular in HKFSM. It is played with the head of a gorilla, and uses all the rules of soccer; it is popular with the children. Tourists love HKFSM, and travel annually to celebrate the joys of pastafarianism and pirates. Many tourists cast aside their old religion and embrace Pastafarianism after being touched by His Noodly Appendage. The amazing climate, picturesque scenes, and plentiful wenches make the island irresistible. 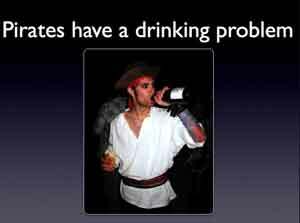 Wednesday, September 19th is Talk Like a Pirate Day. My guess is that a large percentage of Pastafarians will observe this holiday. 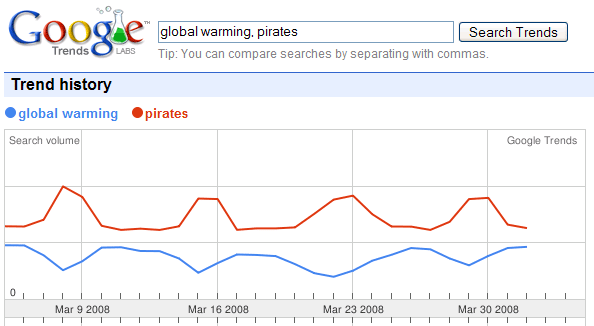 For more information, I strongly suggest that you check out the website talklikeapirateday.com. Are any Pastafarians attending? Send me pictures if so, please. Thanks. 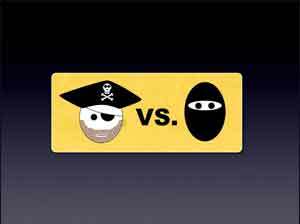 Wellington Grey has published a seminal report discussing a topic of much importance to recent memes: Pirates Vs. Ninjas. Grey looks not only at weapons and fighting characteristics, but at environmental concerns and challenges faced by each groups. 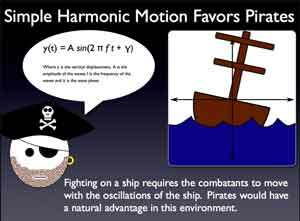 Simple Harmonic Motion favors pirates: Fighting on a ship requires the combatants to move with the oscillations of the ship. 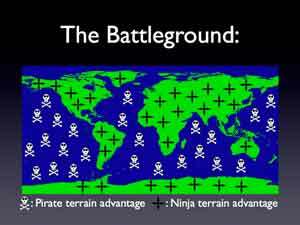 Pirates would have a natural advantage in this environment. Grey also looks at the influence of the FSM, Himself. I recommend that anyone interested in a attaining a greater understanding of the issue take a look at the report.